Fifa president Gianni Infantino hopes the 2018 World Cup in Russia will be the first tournament where video referees help officials with "game-changing" decisions. In March, the International Football Association Board (IFAB) said it would test technology over a two-year period to help with goals, red cards, mistaken identities and penalties. That was set to start no later than the 2017-18 season but Infantino said testing would "start now and will take two years". The Swiss, who succeeded Sepp Blatter as boss of world football's governing body in February, added: "This means that by March 2018 we will see if it works or not. "I really hope that the World Cup in Russia will be the first World Cup where video refereeing is used to make refereeing maybe better." In the experiments, a video assistant referee will have access to video replays during matches and will either review an incident on request or communicate with the referee proactively about an incident that may have been missed by the officials on the field of play. On a visit to Moscow, Infantino also said he had received assurances from the Russian government that the economic crisis engulfing the country would not affect preparations for the 2018 tournament. Meanwhile, Uefa has selected British company Hawk-Eye as the goal-line technology supplier for all matches at Euro 2016. The camera-based system that is used in the Premier League was chosen ahead of Germany-based Goal Control, which was in operation at the 2014 World Cup. European football's governing body Uefa decided to introduce the technology in January after incidents where goals had not been given despite crossing the line. Co-hosts Ukraine were denied such a goal against England at Euro 2012. In contrast to the Premier League, Uefa has previously opted to use additional assistant referees in its competitions, including the Champions League, and will continue to use five officials at Euro 2016 in France. "Goal-line technology and additional assistant referees complement each other perfectly," Uefa's chief refereeing officer Pierluigi Collina said. Hawk-Eye, which uses seven cameras per goal, was chosen after a selection process in which all four Fifa-licensed goal-line technology providers were invited to provide information and submit commercial offers. 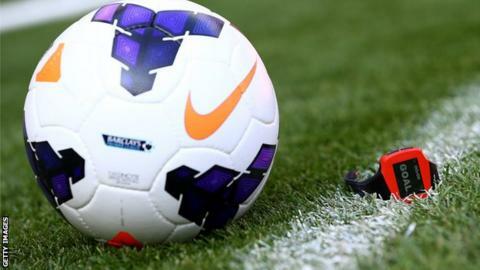 It was the first company to receive a Fifa goal-line technology license and, in addition to the Premier League, it is already used in the Bundesliga and Serie A as well as in the 2015 Women's World Cup in Canada.